Keystone propaganda map promoting the settlement of the Canadian west. Map of the North West Part of Canada Indian Territories and Hudson's Bay. 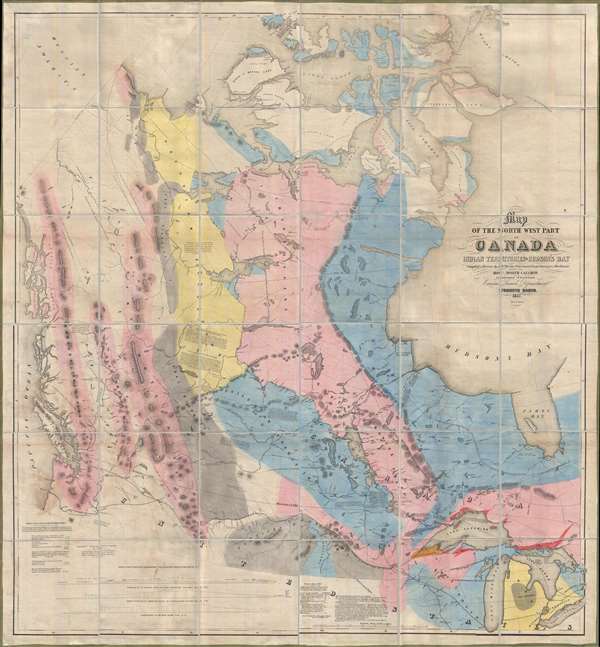 The first map of the west published and issued in Canada, this is an essential document of the Canadian westward expansion. Magnificently huge, Thomas Devine's 1857 large-scale map details Canada west of the Hudson Bay. The map's very possessive title communicates its purpose: to promote ownership over and settlement of the 'North West Part of CANADA.' It's coverage extends from James Bay and the Great Lakes westward to the Pacific, and from the high Arctic as far south as Chicago and the Columbia River. The whole is richly colorized and annotated to promote the region's unexploited richness and potential wealth. By 1856, Canada had asserted tenuous claims to its northwestern territories, but little was known of their potential. Instead, the western part of Canada was controlled by the secretive Hudson Bay Company whose governor, Sir George Simpson, testified that the region was inadequate for settlement and offered a paucity of resources. On the other side of the argument were the Expansionists, who were eager to migrate westward and saw the Canadian prairies as an attainable Eden. To address this question, the Commissioner of Crown Lands for Canada, then Joseph-Édouard Cauchon, a dedicated expansionist with business interests in Manitoba, ordered his chief surveyor Thomas Devine to compile a grand map assessing the region. One of the best examples of the changing perspective on the land … a product of the expansionist impulse. In addition, the map address the terrain and mineralogical resources, identifying copper deposits along Lake Superior, and a coal belt running from Great Bear Lake to the Canada-US boundary. Soil types and other geological formations are noted using color coding to distinguish regions. The map also includes some detail within the United States, including the Gov. Stevens route for the Northern Pacific Railroad, and John Jacob Astor's fur trading post at Astoria, and manned border fortifications. In the same year this map was issued, the British North American Exploring Expedition, under John Palliser set off. The expedition investigated the geography, climate and ecology of western Canada. This was the first detailed and scientific survey of the region from Lake Superior to the southern passes of the Rocky Mountains. Until the publication of the Palliser map in 1865, the present map was the finest and most detailed large scale map of this region. This map appears in two editions. One edition was published as one of 8 maps included with a supplement to the 1857 Report of the Commissioner of Crown Lands, in this case Joseph-Édouard Cauchon. That example is on thin paper, typically uncolored, and was issued by S. Derbishire and G. Desbarats. The other example, as seen here is a richly colored, dissected, separate issue published privately by Maclear and Company. It is of note that Cauchon, who ordered this map produced, resigned from his position as Commissioner of Crown Lands just one month after it was published. While there is no clear evidence linking Cauchon to the privately published edition offered here, it would certainly have been in his character, bold, brash and enterprising, to have been involved in the promotion of this blatantly expansionist document which perfectly aligned with his own business interests. Thomas Devine (1818 – November 14, 1888) was an Irish surveyor and cartographer active in Canada during the middle part of the 19th century. Devine mastered surveying working the the Ordnance Survey of Ireland and the Royal Engineers. He immigrated to Canada around 1846 and took work as a provincial land surveyor, eventually becoming official surveyor and draftsman for the Crown Lands Department, Upper Canada. In 1857, he was put in charge of the Upper Canada Surveys Branch, succeeding Andrew Russell, and was immediately assigned the work of compiling and publishing a group of important maps focusing on western Canada. There he completed his most important work, a great wall map entitled Map of the North West part of Canada, considered the first map of the west compiled and published in Canada. Following the Confederation, he became the Deputy Surveyor of Ontario, producing his last map in 1877. He retired in 1879, returning briefly to Ireland before settling down in Montreal. He was a member of the Royal Geographical Society, the Geographical Society of Berlin, and the American Geographical and Statistical Society. Joseph-Édouard Cauchon (December 31, 1816 – February 23, 1885) was a Canadian journalist, businessman, and politician. Cauchon born in Quebec City, the scion of one of Canada's oldest and most distinguished French families. He was educated at the Petit Séminaire de Québec from 1830 until 1839, after which he studied law in the offices of James George Baird. He passed the Canadian Bar, but there no record that he ever practiced law. After 1841, he took work as a journalist for Le Canadien. Impressed with the newspaper business, he partnered with his brother-in-law Augustin Côté, to publish the biweekly Journal de Québec. Cauchon has a reputation for being brash, opinionated, and ambitions. He is described by one of his enemies, Laurent-Olivier David, as 'ambitious, violent, enamoured of money, honours, and luxury, lacking in scruple, enterprising, full of shifts and expedients.' He was, on the other hand, admired by his friends as a brilliant politician, journalist, and historian. He supported the Confederation in a series of articles calling for a 'centralized federal system, resembling a legislative union rather than the American constitution.' Cauchon held various elected positions and was appointed Commissioner of Crown Lands for Canada in 1855, at which time he ordered several important maps produced. After leaving the position in April 1857 he continued to pursue he political ambitions, becoming a representative, senator, mayor of Quebec City, and more. He took part in the forming of the new government following the Confederation. He had an interest in western Canada including business in Manitoba. In time he retired with his son to a homestead called Whitewood in the Qu’Appelle Valley. He lived there on 'hard-tack and bacon,' and died on the 23rd of February, 1885. Very good. Backed on fresh linen. Custom slipcase. OCLC 629720003. Phillips, P. L, Alaska and the Northwest Part of North America, 1588-1898, page 55-56. Phillips (America) page 199. Francis, R. Douglas, The Prairie West as Promised Land, page 5.